Embedded Instruction is an evidence-based multi-component approach for planning, implementing, and evaluating instruction for preschool children with disabilities in inclusive settings. The Tools for Teachers professional development package has been shown to increase teachers confidence and competence with embedded instruction and promote positive outcomes for children (Snyder et al. 2018). The Embedded Instruction grant connects the DRDP (2015; California Department of Education 2016) assessment to curriculum and instructional practices to strengthen the relationship between assessment and instruction and provide planned and intentional instruction for children with disabilities during everyday activities. Local educational agencies (LEAs) within California will work with experts and researchers in the area of embedded instruction to pilot these techniques and practices in their early childhood programs. Listen to a California preschool teacher talk about how using the DRDP (2015) and embedded instruction has helped her to enhance outcomes for a child with disabilities in her classroom. Teachers and coaches from your district attend two days of training about embedded instruction. 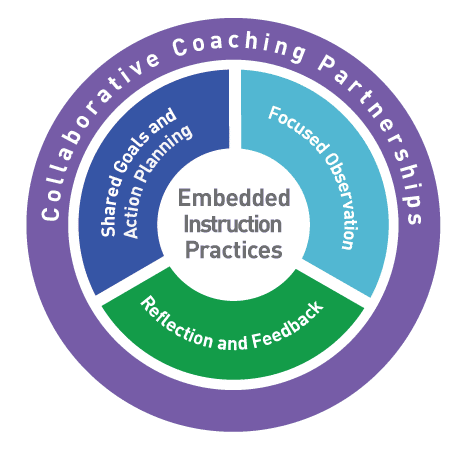 Coaches are trained to use practice-based coaching to support teachers' implementation of embedded instruction in the classroom. Teachers and coaches have access to the website for resources, materials, and our new online learning courses. Coaches and teachers participate in monthly practice-based professional learning communities to strengthen collaboration and practice together. The project team works with coaches and administrators to support the project from start to finish. The Tools for Teachers professional learning and development package uses an approach to coaching called practice-based coaching. Practice-based coaching (PBC) is a cyclical process involving (1) planning goals and action steps informed by a strengths and needs assessment, (2) engaging in focused observation, and (3) reflecting on and sharing feedback about teaching practices. A growing body of research has highlighted the importance of coaching and practice-based coaching for effectively supporting teachers to use and sustain new practices such as embedded instruction (Snyder, Hemmeter, and Fox 2015). Listen to two California teachers who participated in practice-based coaching talk about their experiences. Embedded instruction happens naturally throughout the day. Embedded instruction helped me be an intentional teacher. My coach provided support and feedback when I needed it. Embedded instruction made a big difference for children. Materials and resources for the Embedded Instruction California Project are derivatives of Embedded Instruction for Early Learning at the Anita Zucker Center for Excellence in Early Childhood Studies, University of Florida. Copyright © 2019 Embedded Instruction for Early Learning. 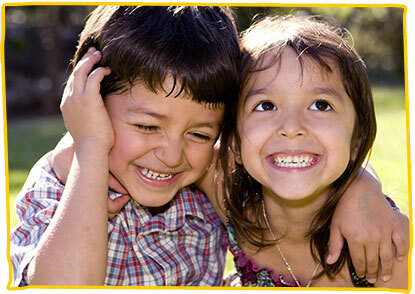 Anita Zucker Center for Excellence in Early Childhood Studies, University of Florida.